Summer is well underway for 2018 and mosquitoes are once again making outdoor activities difficult. These insects can make any outdoor party or sporting event miserable. Mosquitoes have transmitted many diseases including malaria, dengue, yellow fever, encephalitis, and more recently the West Nile and Zika viruses. They can even cause a client’s pet to get heartworm. 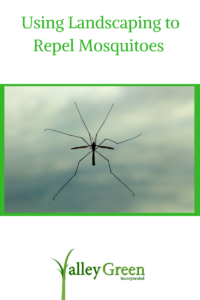 Keep clients in the know as to how you can keep mosquitoes at bay on their property using various special landscaping techniques. Use these suggestions when educating clients on mosquito-proofing their yard. One of the easiest ways to mosquito-proof a yard is to grow plants that repel them. Lavender, Citronella Grass, Catnip, Marigolds, and Geraniums naturally repel mosquitoes. Suggest these plants if your client wants to seek out a more natural way to combat mosquitoes. Another easy way to keep mosquitoes at bay is to make sure your client’s yard is free of standing water. Watch for mud puddles, tire tracks, and poorly drained low areas. Take care of the problem by adding a layer of stone, covering it with topsoil and then reseed it if needed. If you need to lay down mulch, try using cedar. Cedar oil repels many types of pests. Suggest mulching around the spots where your client spends the most time outside. The oil will eventually dry up so you will need to mulch again. It is easy to tell when to do so because the cedar will no longer give off a scent.